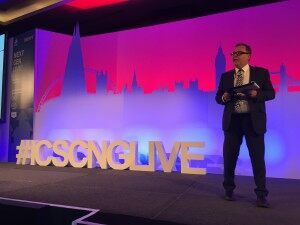 On Monday morning I saw the culmination of many years worth of work by ICSC staff and volunteer leaders with the first European ICSC NextGeneration event. An idea inspired years ago by the NextGen program founded 15 years ago in the U.S., the event has been in the planning and development phase over the past year as the European NextGen Leadership Board has formed with members from around the continent. The event itself featured three high-energy speakers offering advice for how to manage your career and business in today’s world. And as an ICSC first, the event was live-streamed over the web to ICSC groups and manners around the world. ICSC’s Next Generation program was formed in Chicago in 1990 by Peter Eisenberg, Andy Stein and Norris Eber as a method to engage and develop ICSC’s young members through three principal areas: Education, Networking and Mentoring. The program has grown with enthusiasm across the USA with more than 90 cities having hosted over 1,100 events for 81,000 people since then. The group in the US today is overseen nationally by the Next Generation Leadership Board, a volunteer board of directors that oversees the program’s activities and spearheads initiatives to keep the program innovative and fresh. More than 2 years ago, as liaison to the NGLB I began working with Michel Zalac, ICSC’s staff person in London who took on the responsibility for the NextGen program. Over that time, Rik Ertink of CBRE Global Investors was identified as the volunteer chair and we began recruiting other volunteers across the region, as well as beginning to identify the mission and goals of the European Leadership Board. Prior to the larger event this morning, Rik and his board held their first formal meeting. I was invited to attend as liaison to the US board, and was fascinated by the board; 22 people from 9 different countries participated and discussed their strategy for success throughout Europe, prior to adjourning to the NextGen Live event. After the ICSC European conference last year, the forming Leadership Board began talking about the idea for NextGen Live; a Ted Talk-style event that would bring leading speakers together for the conference attendees, but reach beyond that and connect the many NextGen members scattered through a dozen countries in the region who wouldn’t be at the conference. The speakers were: Josip Kardun, CEO of Atrium European Management, who spoke about key strategies to managing your business, employees and teammates using real-world strategies and experiences, not MBA-style case studies. Dr. Julie Grail, CEO of the British Improvement Districts spoke about managing your partners and spoke about the successful public-private partnerships through Business Improvement Districts. Finally Chris Igwe, head of CBRE in France spoke about managing your own communication and the importance of making things happen as a leader. 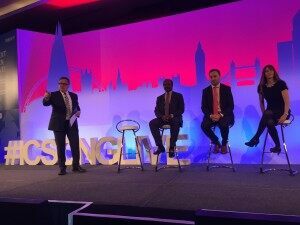 The speakers then joined together as a panel to take on several questions about how to be more effective in networking (a clear sweep of them said listening was the most important skill) and creating spaces to attract great retailers. People in three countries outside the UK chimed in with twit-pics of their watch events as well as multiple questions in the Q&A portion that followed the formal program. The program was designed as a model that can be replicated using the technology developed for today’s program for other NextGen groups across the US and Europe.